In this age of social media, cloud computing, big data, video streaming and ubiquitous online connectivity, telecommunications services providers find themselves operating in a Dickensian world where everyone is asking for more – that is, more bandwidth capacity. High global bandwidth demand has spurred terrestrial and submarine cable network operators to double the amount of capacity deployed on international Internet, private and switched voice networks to a prodigious 451 terabits per second between 2014 and 2016, according to data from market research firm TeleGeography. That hasn’t been enough, however, to meet the ever-increasing demand for bandwidth from the Facebooks, Googles, Amazons and other major content providers in this always-online world. In addition, there is demand from the vast number of connected people who regularly consume online content. Market research firm Statista has forecast the number of smartphone users worldwide to reach 2.9 billion by 2020, up from an estimated 2.3 billion in 2017. New cables extending to the east and west from India will help to accommodate surging capacity demand and enhance network resiliency. In Asia, international bandwidth usage has grown 50 percent between 2015 and 2016 as content and Cloud services providers, as well as, the companies that host their digital resources have driven up demand. Asia has vast amounts of data to send and receive from North America and Europe. Such connections are vital to the Internet backbone operators who help connect the countless emails and phone calls people and businesses make each second, as well as the content providers that operate huge data centers where their digital resources are managed and hosted. Demand for international bandwidth connected to Asian countries is expected to increase more than 10-fold between 2017 and 2023, while bandwidth linking Europe to the Middle East and the rest of Asia is forecast to grow sevenfold during the same period, according to TeleGeography. It said the region derives most of its international bandwidth through fiber-optic submarine cable systems. These systems are widely expected to become more important over time as intra-Asian connectivity, as well as, links to Europe and North America help power the development goals of regional economic powerhouses like China, India and Japan. TeleGeography estimated that 13 new submarine cable systems worth a combined US$2.5 billion were deployed in strategic telecommunications routes around the world in 2016. Bill Barney, the Chief Executive at Reliance Communications in India, sees the increased capacity from new submarine cable systems would not only help meet the bandwidth requirements of the large Cloud and content providers, but also the numerous companies large and small that drive the world’s collective economy. With an eye to meet the global market’s need, Reliance Communications subsidiary Global Cloud Xchange (GCX) recently unveiled plans to construct its US$500 million Eagle express cable system. This new 16,650-kilometer submarine cable network is expected to deliver the fastest telecommunications routes from Mumbai going east to Hong Kong and west to Italy. Barney has dubbed this project as the “Cloud & Fiber Initiative” of GCX, which owns and operates the world’s largest private submarine cable system that spans more than 67,000kms. 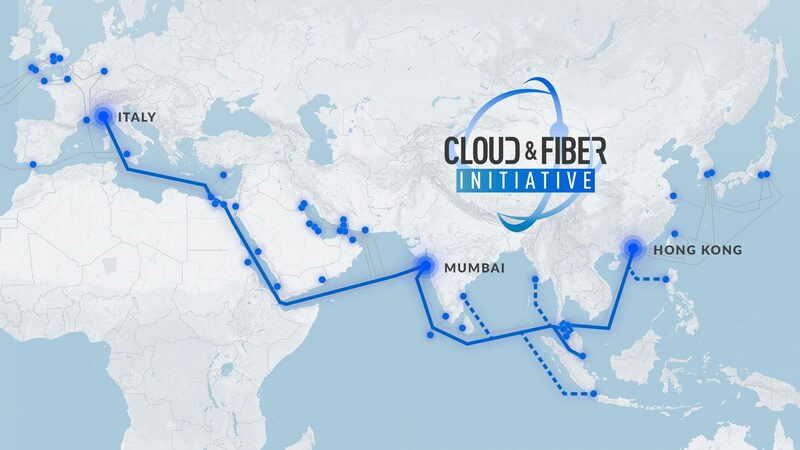 “The Cloud & Fiber Initiative is our response to the key requirements in the global marketplace, driven by explosive growth in cloud and infrastructure programs by enterprises around the world,” Barney, who also serves as Chairman and Chief Executive at GCX, said. Eagle’s design has the system heading east from Mumbai to Hong Kong via Thailand, which will stretch about 7,750kms with landing points in key markets like Singapore. Going west, Eagle will cover an 8,900kms route that will take it from Mumbai to Italy via Egypt. Alan Mauldin, a Research Director at TeleGeography, said India provides a strategic location in the context of the larger global submarine cable network. “New cables extending to the east and west from India will help to accommodate surging capacity demand and enhance network resiliency,” Mauldin said. GCX estimated the Eagle cable system to allow companies to rent and own subsea capacity with speeds from 10 gigabits per second to several hundreds of Gbps between India and the hi-tech hubs across Asia, the Middle East and Europe. Wilfred Kwan, the Chief Operating Officer at both Reliance Communications’ Enterprise unit and GCX, said the Eagle system will enable a growing number of internet start-ups, new-generation carriers and smaller cloud services providers to buy and rent fiber at affordable rates. Business and government purchases of tech goods and services in India are predicted to hit US$65 billion in 2018, up from an estimated US$60 billion in 2017, according to Forrester Research. With India’s position as Asia’s third-biggest information technology market after Japan and China, the growing infrastructure of GCX has already started attracting major cloud players in the country. Chinese e-commerce giant Alibaba Group recently announced that it is entering the cloud market in India with the establishment of a new data center in Mumbai this January by its subsidiary Alibaba Cloud. New York-listed Alibaba has partnered with GCX to enable Alibaba Cloud to offer its cloud services to the country’s growing start-up community and larger companies. Simon Hu, President of Alibaba Cloud, said, “local enterprises are innovative and operating in growth sectors.” “We look forward to empowering them through cloud computing and data technologies,” Hu said. It marks an escalation of Alibaba Cloud’s international development initiatives as it seeks to unseat Amazon Web Services as the world’s top provider of cloud services, according to a South China Morning Post report. Founded in 2009, Alibaba Cloud is the biggest provider of public cloud computing services in China with about 2.3 million customers to date. Barney pointed out that the Eagle cable system, which is expected to be completed by the end of 2020, will create a next-generation IP and cloud environment across the emerging markets corridor that encompasses the Middle East, as well as, the large economies of China, India and Indonesia. The completed Eagle system is also expected to put India on track to become the next major global hub for data centers, according to Structure Research, an independent consulting firm that tracks hosting and cloud infrastructure services providers. “The new subsea cable system that will connect India to strategic markets in Asia, Africa and Europe will be critical in advancing the country’s position as a global data center hub,” Jabez Tan, a Director at Structure Research, said. Data Center Operators that offer colocation services basically lease physically secured space, power, cooling and multiple Internet connections for the servers, storage systems and networking equipment of their business customers. These facilities are where a wide range of software and other digital resources offered by cloud and content providers are hosted. In that regard, the Cloud & Fiber Initiative of GCX makes it well-positioned to be “very much involved in digital transformation in India and beyond,” according to Barney. “Our initiative levels the playing field for India’s companies to compete in the new digital order,” Barney said. Ahead of the Eagle cable’s deployment, the company has also entered into key partnerships to expand its cloud ecosystem and data center footprint, further solidifying India’s position as a key global hub in the next wave of technology growth and expansion across the emerging markets. This includes a new state-of-the-art data center located in Reliance Communication’s Dhirubhai Ambani Knowledge City (DAKC) –a technology park spread over a 56-hectare site in the Mumbai area. “We will concentrate on migrating and managing our enterprise customers’ data, gathered from various public and private cloud facilities, in this large complex,” Barney said. In this hi-tech Dickensian world, if you ask for more, expect major telecommunications network operators like GCX to not be surprised and actually give you more.